Student entrepreneurs from University of Houston’s RED Labs accelerator will pitch their concepts to startup community members at the inaugural Bayou Startup Showcase event, held in partnership with Rice University’s OwlSpark accelerator on Aug. 14. Front row (from left): Travis Arnold, Rakshak Talwar, Andrew Paterson, Gabe Hodges and Joshua Wathen. Middle row (from left): Daniyal Inamullah, Micah Thomas, Valeria Bernadac, Julia Loennegren and Bala Raja. Top row (from left): Tom Huynh, Tri Nguyen and Gavin Garvey. Houston’s newest wave of startup companies will pitch their plans to startup community members during the inaugural Bayou Startup Showcase on Aug. 14. This free event is the first time the University of Houston’s accelerator program, RED Labs, will partner with its Rice University counterpart, OwlSpark, for a joint day of pitches from participants. Bayou Startup Showcase is open to the public and will serve as the final step for RED Labs and OwlSpark teams that have been working for 12 weeks on new business concepts that aim to advance several sectors, from healthcare and disaster relief to consumer products. Several of the companies will also have prototype models of their respective products at the event. 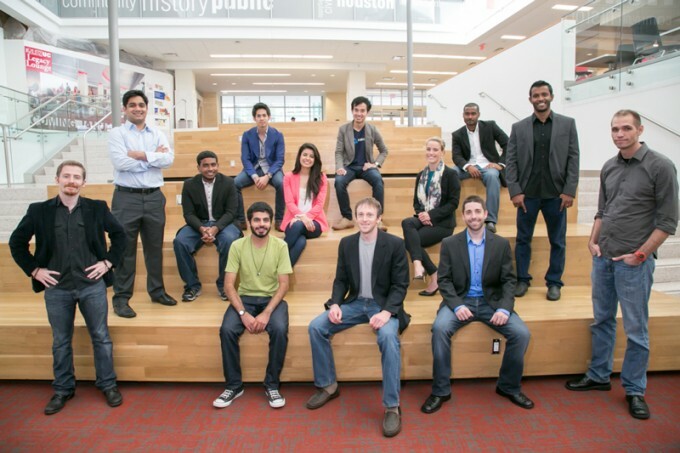 The teams from both accelerators are mostly comprised of current students, alumni and faculty from a variety of disciplines at UH and Rice that include entrepreneurship, management information systems and engineering, among others. Some teams also include professional members who can lend practical work experience from their industry. Here, we profile four of the five RED Labs teams along with two of the eight OwlSpark teams that will share their business plans next week at the Bayou Startup Showcase. Currently, rapid diagnostic tests for a number of critical medical conditions have limitations including the inability to detect low levels of a disease target and medical professionals’ subjectivity interpreting test results. Luminostics, Inc. provides solutions to these limitations with a smartphone attachment that uses light-emitting nanoparticles to offer more accurate detection sensitivity and a quantitative, objective readout in less than 20 minutes. The company is comprised of UH Chemical Engineering Ph.D. students Gavin Garvey, Andrew Paterson and Bala Raja along with practicing physician Gabe Hodges, M.D. The group says they are seeking brand awareness as they continue to test and perfect their concept leading up to an eventual market debut. The team plans to introduce the potential benefits of their technology not as a prototype, but as a vision of their final product. Bayou Startup Showcase will mark the first public pitch for RaptorBird Robotics, a company that aims to make civilian drones more intelligent. UH electrical engineering students Rakshak Talwar and Micah Thomas say these drones would have the potential to be programmed for practical applications such as package delivery in disaster relief areas following a hurricane or land surveying for prospective mining sites. Zodist is an online retailer of e-liquid subscription boxes with direct shipping, offering four custom bottles of e-juice to customers after they submit an online flavor profile. The idea for Zodist resulted from Huynh, a former smoker who switched to electronic cigarettes after discovering e-juice flavors he enjoyed. It was this experience that led Zodist’s founders to focus on customer service, from the first visit to their website to ultimately receiving the product in the mail. Thermal Nomad’s founders are combining their individual educational backgrounds and unique professional experiences as they present a self-heating thermos device. Bauer MBA (entrepreneurship) alumni Travis Arnold was a professional fire breather while fellow MBA grad (finance) Daniyal Inamullah was a prize-winning APICS national supply chain competition contestant. They recruited UH Gerald D. Hines College of Architecture industrial design senior Dylan Bailey to create the user experience around the revolutionary heating technology that powers the thermos. Thermal Nomad sets itself apart from competitors by enabling the user to quickly heat foods and liquids anywhere. The device contains a double wall vacuum seal and is able to heat room temperature fluid and many foods up to 180 degrees in two minutes. Thermal Nomad’s heating speed and portability will benefit numerous consumer markets including professional sports and fitness, campers and hikers, and commuters like working parents. The team’s vision also includes to eventually market the device as a disaster relief tool for hurricane or flood victims. Wavve provides a nanotechnology-based water filter system that provides clean drinking water solutions worldwide. Their technology simultaneously inactivates bacteria and removes hazardous chemicals, volatile organic compounds (VOCs) and heavy metals. Rice University Electrical and Computer Engineering Professor in Practice Ray Simar, along with Rice electrical engineering graduate student Yize Zhao, are co-founders of a BSS team called Rebel Putter , the world’s first multi-sensory high-performance putter. Their product targets beginning and intermediate golfers and delivers visual, audio and tactile feedback in real-time. Rebel Putter will have their latest prototype with them for attendees to try out following team pitches. However, the founders aren’t relying on the technology to speak for itself and are putting in hours of steadfast preparation each day so that they can ultimately convey their company’s “value proposition” to the audience. Big Delta Systems is the brainchild of Rice engineering alumnus Adrian Yao, engineering Ph.D. alumni Charu Galande, Suman Khatiwada and Neelam Singh along with Rice MBA alum Shahriar Khan. They offer a high-powered, free-form lithium-ion power source that increases run time while reducing weight. The batteries have unprecedented fire safety and can be flexible, allowing integration into readily available materials on the market, specifically wearable devices like smartwatches. “The technical aspects of our company have always been in place because four of us are engineers, so we have a fully functional prototype,” Yao said. “However, OwlSpark has been instrumental in developing our target markets,” Yao said. Data is Beautiful Solutions (DiBS) offers a solution to the growing high-dimensional data problem in biomedicine and other industries. Their tools render easy-to-use, elegant visualization models requiring no programming experience from users. One Jump aims to inspire underserved students to pursue higher education through a mobile-compatible website that offers easy access to an aggregated database of affordable and/or subsidized co-curricular opportunities. HospiTable founders have reimagined eating in a hospital bed by designing and developing novel replacements to the current standard implements that make this task difficult. This will assist in promoting bed-bound patients’ abilty to eat, freeing up nursing resources and decreasing extended hospital stays. Nexus Software, LLC. has developed a photo/video sharing application called “Corners,” where users share content publicly and privately while allowing a seamless transition between taking photos and capturing video. Prosus Health is developing affordable assistive technologies for individuals with disabilities, including the wheelchair mounted R-ARM, a robotic reaching aid that allows individuals to reach and manipulate objects over four feet away. The beta-tested, safety reviewed technology—created by bioengineering undergraduate students Nimish Mittal and Sergio Gonzalez has been featured nationally on CNN, Good Morning America and NPR. YouHootMe is a web-based geographical social discovery tool developed by Rice student athletes John Poehlmann and Ross Winship that allows users to randomly connect one-on-one through a video chat service. For additional information about Bayou Startup Showcase, visit www.bayoustartupshowcase.com.